Winter Is Coming…What’s in store for us? To fans of the wildly popular television series, Game of Thrones, the phrase and motto of House Stark is one of warning and constant vigilance. Not only does Winter usher in a cold and dark period of unknown length, but reawakens ancient humanoid creatures called White Walkers – the medieval fantasy’s version of zombies. 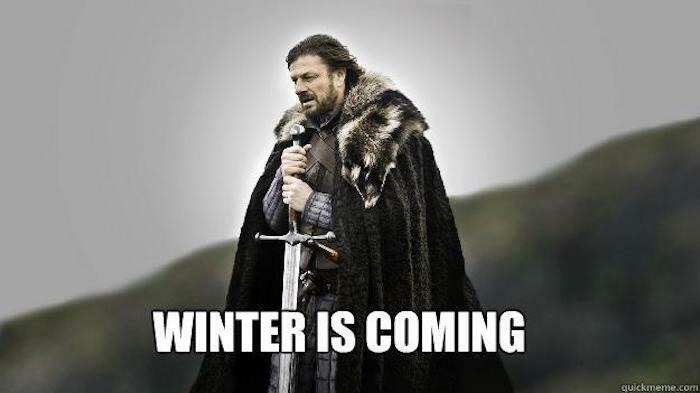 Fortunately, the words winter is coming, aren’t so foreboding for the rest of us. Winter officially arrives in our region at 8:28 AM PST on December 21, 2017. It’s the shortest day of the year too, with sunrise at 7:48 AM and sunset at 4:29 PM. That translates into seven hours and one minute less daylight than we enjoyed on the first day of Summer, June 21, 2017. Recently, the National Oceanic and Atmospheric Administration forecasters released their weather predictions for the winter of 2017/2018. In the Pacific Northwest, where we live, below average temperatures are expected. We’re part of the so-called Northern Tier of the country extending from Minnesota to our coastline and up into Southeast Alaska. The rest of the country falls into the equal chance category. What, what, what? Apparently, it means there is an equal chance of above, near, or below-normal temperatures and/or precipitation. Sounds like a weatherman’s bye to us. In all fairness, weather can be very difficult to predict too far in advance. NOAA will be updating their predictions again in mid November. Regardless, there’s one thing we can be sure of, winter is coming.